When it comes to routers–black is the new black! My Unifi router, just like yours is probably located near my TV , and unless you’ve got a old CRT from the 1960’s–your TV is black. So you want a router a matches your living room, and not stand out. Apart from it’s awkward height, the Asus really fits in with my HTPC and speaker set, and it should blend in nicely with any Home Theatre system, unlike the ugly white plastic-ky feel of the Dlink. Not only does it look Gorgeous, it has a modern looking matte finish with diamond pattern for extra ‘oomph’. The only downside could be the Blue LEDs, some people love them, some people hate them. I’m pretty impartial. Asus does have a full range of routers though, from the very basic N12, to the feature rich Asus RT N66U, and while you may be able to afford that Ferrari–that doesn’t mean you should buy it. Just like everything else, the features on the routers commensurate with price, the basic N12 cost slightly more Rm100, while the feature rich N66U could set you back a whooping RM600. So do you need the features, well it depends entirely on what sort of internet user you are–and how much you’ve got in the piggy bank. The basic N12 is a entry model router that comes with all the features you expect on a basic router, however, the N12 HP comes with two 9DB antennas, that Asus promise would increase your WiFi range by 300%. I’m guessing the HP suffix stands for High Powered! Do they really extend the range? In a word–Maybe. 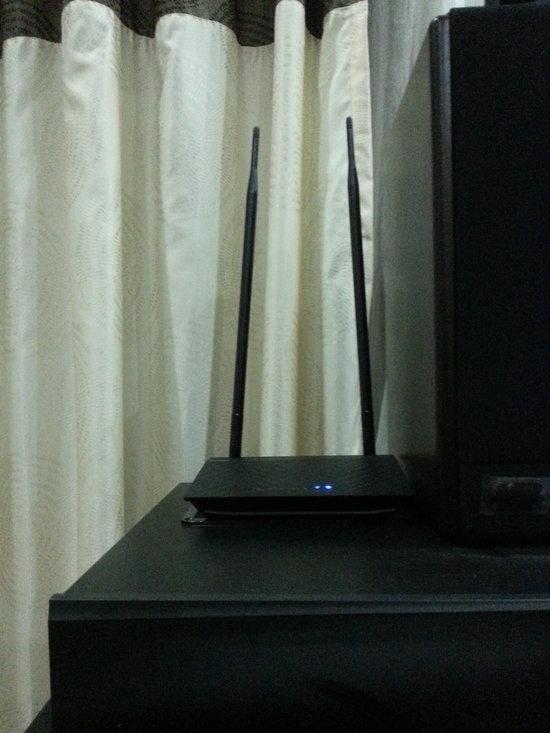 Your router range can be increased by placing your router in a different location or elevation, just sticking two large giraffe-neck long antennas on a device isn’t going to make it work much better if your router is behind a metal TV set. So the antennas will help, but only after you’ve addressed some other issues as well. However, as compared to the DLink, this router has got tonnes more power, and should have much better range and coverage. The High Power though comes at a price–the N12 HP cost nearly RM200, while the regular N12 cost about half the price with the exact same feature set. Are those twin 9dB antennas really worth the extra Rm100? There were also the N13 and N15 routers, which come with USB ports and a few other bells and whistles–but with only one detachable 5dB antenna. I don’t know about you, but I’m one of those guys who just gets annoyed when my neighbours WiFi is stronger than mine–in my OWN HOME! So if your male ego is directly tied to the strength of your WiFi–then you really should be going for the N12 HP router–even though those abnormally long antennas make it look like a black Yao Ming. If you’re living in a dense condo or flat, and your WiFi is competing with 20 of your neighbours for those precious wireless channels, this router could be the answer to basically over-powering that annoying neighbours Wifi. Also, you could use it to broadcast messages via SSID, simply create a guest WiFi network, and name it something like “StopListeningToJustinBieber”. However, you also have to keep in mind, that while this is a slightly more premium priced router, the features are basic. You’re essentially paying for a basic router with improved wireless signal strength, that’s it! The test was simple, first I switched on the Asus router, and measured the signal strength from my upstairs bedroom. Then I turned the Asus off and turned the D-Link on and perform the same test. With the routers placed in the exact same location in the downstairs hall, and my laptop not moved in my room, It’s remarkably clear that the Dlink signal strength is nowhere near the Asus. What’s more surprising though, is my neighbours D-Link router still manages to be just a whisker poorer than mine, in my own home! Which just goes to show my point that your signal strength has a lot to do with router location, rather than just pure router signal strength. That being said, your Dlink is nowhere near as powerful as the N12HP. Of course signal strength is just a number. I wanted to see how the routers would compare in file transfers. Unfortunately, this isn’t so straight forward–the D-Link router only supports 802.11g (although it ‘claims’ to support the draft version of 802.11n), while the newer Asus supports the ‘real’ 802.11n, the different protocols really make this an unfair competition. In laymen terms, the Asus was 23 times faster than the D-Link (Twenty Three!!). Also important to note that the 371KB/s is slower than your Unifi connection–making the WiFi a bottle neck. In short if you live in a double-storey house, the standard D-Link router isn’t going to give you the best experience your Unifi connection can achieve. Instead you’ll be limited to poor network connectivity that degrades exponentially for every bit of distance you put between your router and device. 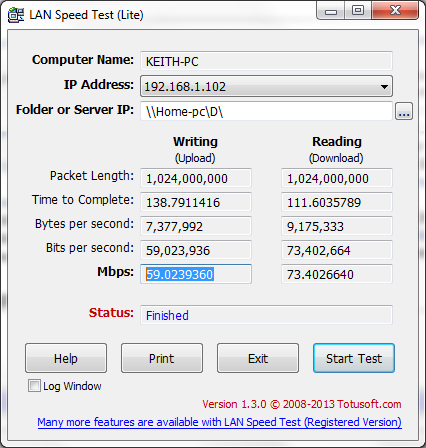 Further testing the LAN speed only serve to prove my point. Running the same test on the N12 HP, reveal a standard transfer rate of about 8-9MB/s. That works out to around 64-72Mbps (although the screenshot below says 59-73), which is roughly 50% of the theoretical limit of the 802.11n. There’s still room for improvement, but that’s probably as quick as you’re going to get with an entry level router. The Asus also comes with some other rather nifty features, including Parental control, multiple SSIDs and even QoS. Though these features are best left untouched if you don’t know what you’re doing. The one ‘silent’ feature that the router offers, that isn’t offered on the standard D-Link router is loopback functionality. Loopback is a really good feature to have on your router, specifically if you’ve got a tonne of IP cameras or devices at home. Basically a loopback on a router allows you to access your devices via DDNS from within your own LAN, which means your apps need only be configured once, and they’d be able to access your IP cameras via DDNS from both outside your network, and within it. A lot of readers have wrote to me about this, since the standard D-Link router can’t handle it. So if you want too access your cameras from your home network–try an Asus router. Finally we focus on the reason I decided to change routers in the first place–security. Routers are computers in their own right, they can run their own code and even execute commands. Therefore they should be subjected to the same security practices as regular PCs, Macs and laptops. This is one of those cases where less is more–there have been multiple disclosures of vulnerabilities on Asus routers such as this and this. Including one published few weeks ago in Defcon. In most cases these targeted vulnerabilities associated with the AI cloud and fileserver. These extra features also provide extra failure points for hackers to exploit. In situations like this a router with less features, like the N12, is actually more secure than their feature rich, expensive cousins. Like I said–less is more. Don’t be fooled though, both the TP-Link and D-Link routers have their fair share of exploits as well. No one router is perfect, what makes your router secure isn’t the firmware it’s shipped with, but the attitude of the provider. Let’s hope Asus takes security seriously and publishes fixes for those exploits. At Rm200, this router isn’t cheap, but I would recommend it as a way of improving your home Wireless connectivity and improve your router security. -Rm200 is a pretty steep price for a basic router. Standard TP-Link and other Asus routers come in at the Rm150 price range. -Long Antenna might make this hard to hide. Would I buy it? I already have. Would I recommend the cheaper Asus or TP-Link routers–not sure. Would I recommend the more expensive routers–not sure either. Thanks for the informative post. Makes me want to switch up my dlink to an asus for unifi. Mostly just plug and play. You’ll need your Unifi username and password though, either get it from your default router, or call TM and they should be able to provide it to you. Hi – just bought the router after having read your article. Trying to install it but having problem with the installation so far. Keep getting pop ups “detecting the internet connection timed out” when it was trying to auto detect the connection type. Any idea to solve this? I have the box and Unifi password ticked. Hmmm, what firmware are you guys using? Mine worked quite well straight out of the box. Don’t mean to ask dumb questions either, but which port have you connected your Unifi modem to? Not a dumb question at all. That was in fact the problem. It was supposed to be LAN 1 but I used others. Thanks to TM support believe it or not. The guy was very helpful. Has your problem been resolved? What port have you connected your Unifi Modem to on the Asus router? Hi kar2on..my problem still not yet resolve. Wifi connection. And the result is I’m facing the Internet connection type timed out. Then I think maybe it was the firmware so I load it with this firmware 3.0.0.4.374.430..and still received same error which is Internet connection type timed out. Is it because of the firmware I’m using? Or anything else..? how about hypptv though? is it stable? i dont know muchm, but there was a dedicated port on the free router and hypptv wont work if its plugged-in the other ports..
Hope this helps anyone who came across the same problem as I had. Thanks man. Is your Hypp TV working? Hi, I am using ASUS RT-N12HP for my unifi. When I am trying to connect through wifi, I often get “Unable connect to Network”. I get this on and off. I even get disconnected while using my wifi. I have no problem with wired connection. Anyone has the same experience? hi.. where can i buy this router? tqvm..
Hi, just installed the router and it’s working superbly except that all Netflix and Hulu in my Apple TV no longer works/available..am using the Unblock US DNS…do you have any idea to ratify this? Unblock US DNS should still work regardless of the router. Make sure the DNS settings are correct on your new router. Guys…is this asus rt n-12p works with iPtV? I am planning to change my TM unifi modem. Thanks in advance…. It should work. There’s a special LAN port for it. But I haven’t tried it as I don’t use HyppTV. I’ve bought a unit of RT-N12HP after read some reviews and completed QIS setup, and all my phones in the house can connected to it and even HYPP TV can run properly. 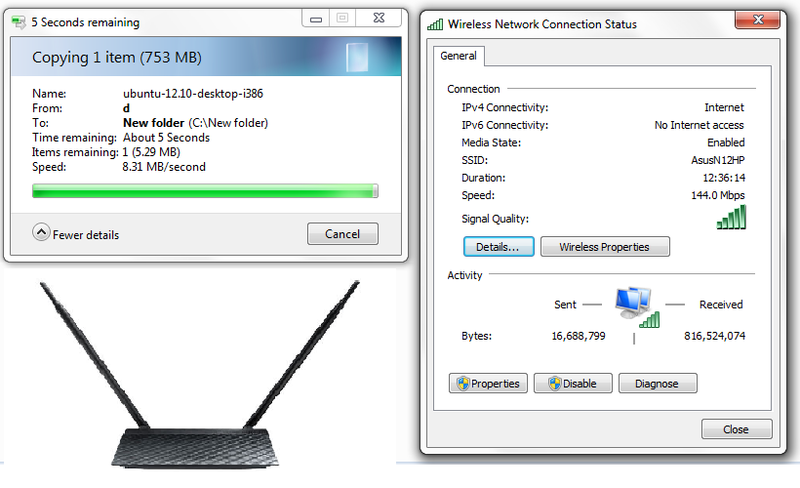 But then there is an issue that my laptop can’t connected even my adapter can detect the wireless network. I don’t know about your specific issue but I had a similar issinternetue with the starbucks here my home. It was to do with my connection settings. And set the ‘Obtain IP Address automatically’. If you had a static address there it may not connect to your new router with the new settings. Connect your hyppTV to port 4. Should work. Have a question. Can the asus rt-n12hp works on stremyx? My place have no unifi coverage. Hi Hanis, you can use this as a generic router, but you’ll still need a StreamyX modem to connect via ADSL. I wouldn’t recommend this for StreamyX, it’s better you get a all-in-one StreamyX router + ADSL modem instead. Can you recommend me the best router + ADSL modem? Not really close enough to recommend one. Just make sure you have good surge protection on the router, because StreamyX travels over copper phone lines and those conduct electricity and susceptible to lightning. Unifi travels over fiber-optics and that doesn’t conduct. not sure why, but my wifi and internet goes really slow after changing to the n14uhp, really really slow…. Hey I have the exact same problem with your 1 year old Asus router, but mine was TP-Link WR841HP. This TP-Link router of mine only last a week, and its WiFi start failing although the wired-Ethernet connections were fine. 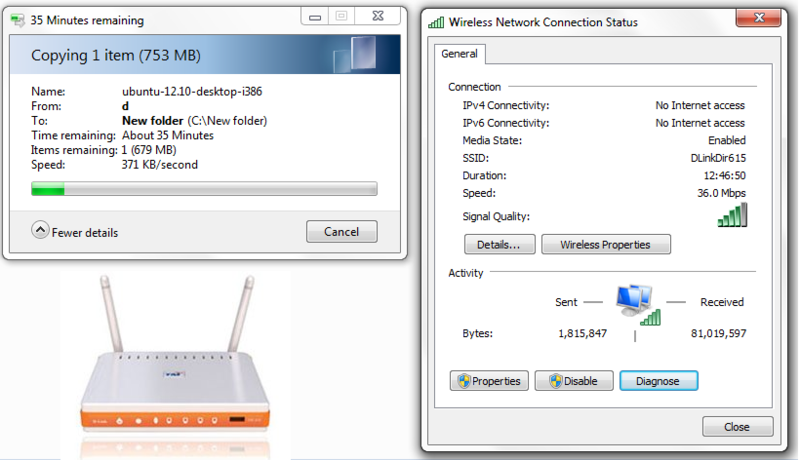 The connection speed for WiFi peak at 0.03Mbps, although my internet speed supposed to be 30Mbps. Sometime it just can’t connect at all. So I send back to the place i bought the router and they check for me, surprisingly it was fine when they tested it. Then i thought that its my own problem, so i went back home and try again, still the same problem. But when I use back the router from UniFi its perfectly alright. Do you know what’s the problem here?